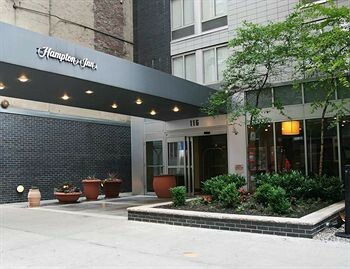 Property Location With a stay at Hampton Inn Madison Square Garden Area Hotel in New York (Midtown), you&apos;ll be minutes from Manhattan Mall and Macy&apos;s. This family-friendly hotel is close to Empire State Building and Times Square.Rooms Make yourself at home in one of the 136 air-conditioned guestrooms. Complimentary wireless Internet access keeps you connected, and cable programming is available for your entertainment. Bathrooms feature shower/tub combinations, designer toiletries, and hair dryers. Conveniences include safes and desks, and housekeeping is provided daily.Rec, Spa, Premium Amenities Take advantage of recreation opportunities such as a fitness center, or other amenities including complimentary wireless Internet access and concierge services. Additional features include a television in the lobby and discounted use of a nearby fitness facility.Dining Enjoy a satisfying meal at a restaurant serving guests of Hampton Inn Madison Square Garden Area Hotel. A complimentary hot/cold buffet breakfast is included.Business, Other Amenities Featured amenities include a business center, limo/town car service, and express check-in. Self parking (subject to charges) is available onsite.